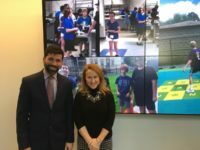 The AEF Stars program offers a way to tell teachers, specialists and school staff ‘Thank you!’ while funding innovative education in the Arlington Public Schools. When a donation is made to the Stars Program, donors are asked which teacher(s) they would like to recognize. Recognized teachers receive a personalized, paper certificate from AEF notifying them that they have been honored with a gift in their name (the amount of the gift is not noted). Whether a donation of $20 or $100, the message to the teachers remains the same: We’re grateful for all you do for our children! A minimum $20 donation per teacher is requested. All donations are tax-deductible. Recognized teachers do not directly receive money from AEF. All funds raised from the Stars Program are put into the AEF general fund and used to award grants at all levels across all of Arlington’s Public Schools. The Ottoson Middle School and Arlington High School teacher who receives the most Star nominations will be honored with a special certificate announcing that he or she is our Star of the Year! Meet our Stars of the Year. Does your company match an employee’s contribution to a 501(c)(3) corporation? Help your donation go even farther! Arlington Education Foundation is a tax-exempt organization under Section 501(c)(3) of the Internal Revenue Code. All donations are tax deductible.